Sometimes, when I don’t feel like doing anything else, I look at that Apple SMC video encoder again. When I last worked on the encoder, I couldn’t get the 8-color mode working correctly, even though the similar 2- and 4-color modes were working fine. I chalked the problem up to the extreme weirdness in the packing method unique to the 8-color mode. Remarkably, I had that logic correct the first time around. The real problem turned out to be with the 8-color cache and it was due to the vagaries of 64-bit math in C. Bit shifting an unsigned 8-bit quantity implicitly results in a signed 32-bit quantity, or so I discovered. Anyway, the 8-color encoding works correctly, thus shaving a few more bytes off the encoding size. Specifies that the next 3 4×4 blocks are encoded with single-color mode (of byte 0x62, high nibble is encoding mode and low nibble is count-1 blocks) and the palette color to be used is 0x45. 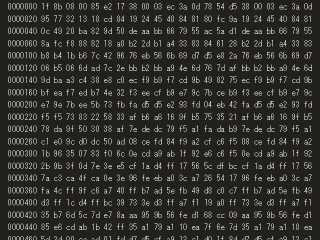 Further, opcode 0x70 is the same except the following byte allows for specifying more than 16 (i.e., up to 256) blocks shall be encoded in the same matter. In light of this repeat functionality being built into the rendering opcodes, I’m puzzled by the existence of the repeat block opcodes. There are opcodes to repeat the prior block up to 256 times, and there are opcodes to repeat the prior pair of blocks up to 256 times. So my quandary is: What would the repeat opcodes be used for? I hacked the FFmpeg / Libav SMC decoder to output a histogram of which opcodes are used. The repeat pair opcodes are never seen. However, the single-repeat opcodes are used a few times. I’m glad I wrote this post. Just as I was about to hit “Publish”, I think I figured it out. I haven’t mentioned the skip opcodes yet– there are opcodes that specify that 1-256 4×4 blocks are unchanged from the previous frame. Conceivably, a block could be unchanged from the previous frame and then repeated 1-256 times from there. That’s something I hadn’t thought of up to this point for my proposed algorithm and will require a little more work. Metal Gear Solid: The Twin Snakes for the Nintendo GameCube is very heavy on the cutscenes. Most of them are animated in real-time but there are a bunch of clips — normally of a more photo-realistic nature — that the developers needed to compress using a conventional video codec. What did they decide to use for this task? On2 VP3 (forerunner of Theora) in a custom transport format. This is only the second game I have seen in the wild that uses pure On2 VP3 (first was a horse game). Reimar and I sorted out most of the details sometime ago. I sat down today and wrote a FFmpeg / Libav demuxer for the format, mostly to prove to myself that I still could. Things went pretty smoothly. We suspected that there was an integer field that indicated the frame rate, but 18 fps is a bit strange. I kept fixating on a header field that read 0x41F00000. Where have I seen that number before? Oh, of course — it’s the number 30.0 expressed as an IEEE 32-bit float. The 4XM format pulled the same trick. A gzip’d file from 1999. I don’t know why I find this stuff so interesting, but I do. I guess it’s no more and less strange than writing playback systems like this.